I have taken a couple of side trips from the main schedule for the maps this year, for just the month of January. These two are Marton-Whanganui and the Nelson line (volumes 4 and 7 respectively). By the end of January I expect to be back at work on Volume 12 and Volume 5 being as explained previously the main priorities for map completion this year. The part of Volume 4 that will be completed is just from Marton to Whanganui incorporating the Turakina-Okoia deviation that I recently mapped. 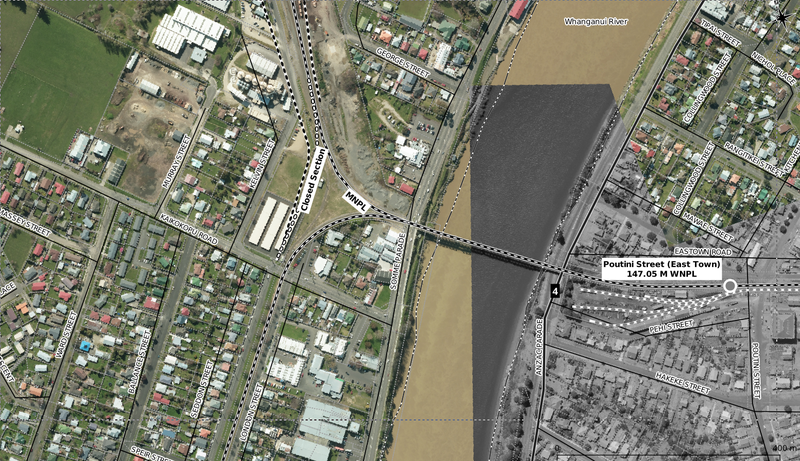 Whanganui is covered by 0.1 metre aerial photography which is of an excellent resolution for tracing off maps. Some years ago I mapped a lot of the stuff around Whanganui city using various sources other than Retrolens and this will come in handy as officially this area has no Retrolens coverage as yet but I have been able to scrounge a small number of orthogonal photos from various sources including other historic archives that I will use to refer to and mosaic if practical. I am not mapping any more of the MNPL than this 43 km section. Whanganui is special to me because I lived there in my childhood. But the lack of Retrolens coverage of the area means it's not worth putting much effort into at present. So I don't expect to spend too much time on this set of maps, which is good. The first photo covers what was the East Town rail yards. Originally East Town was a little further west and this was later called Poutini Street, perhaps when this yard opened. It is now called W(h)anganui. Previously this name was held by the station at Taupo Quay next to the City Bridge (Victoria Ave) which closed many years ago. 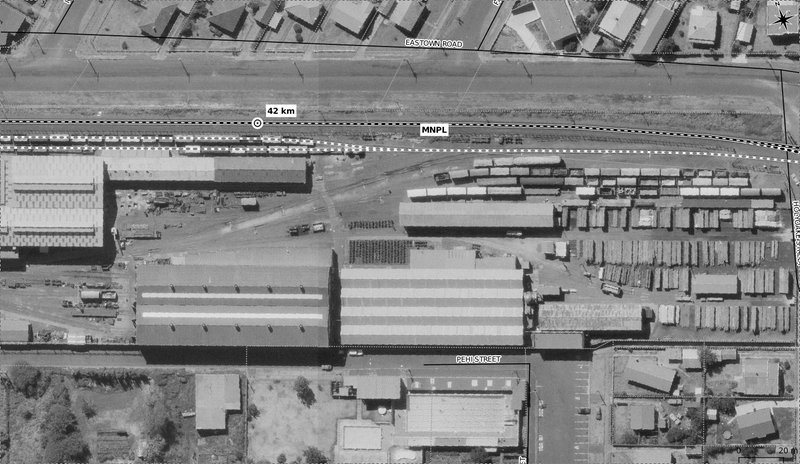 The station was then moved down to the freight depot site, which has also closed. 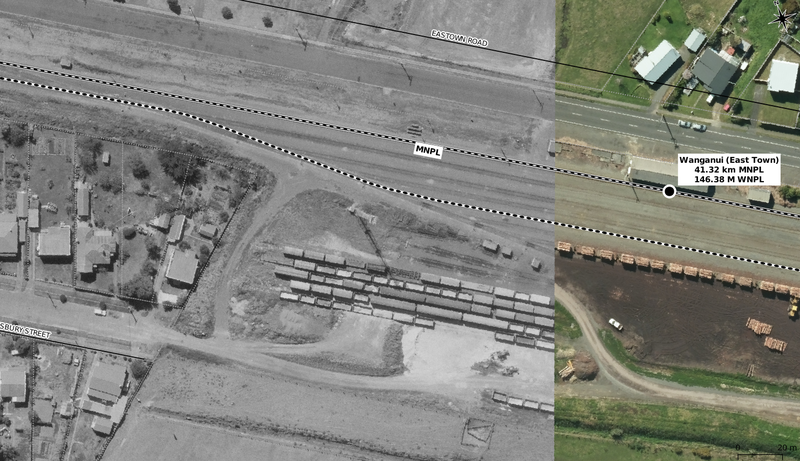 The triangular junction at this site which used to face towards the original station along Moutoa Quay, was altered to face the other way for the new station, and these days it simply links the Castlecliff branch to the Wanganui branch to serve the sidings down there. More of the East Town area, including the East Town Shops, the railway workshops for Wanganui. NZR used to have workshops at a number of different sites, apart from the four main centres. 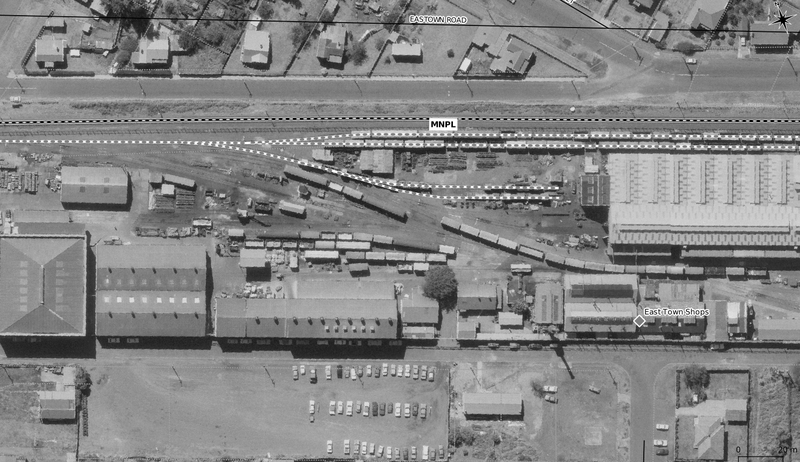 The shops at Wanganui closed in the 1980s, and these days nationwide there are just two sites: Hutt in Wellington, and Hillside in Dunedin, which almost closed a few years ago, but held on as a heavy lift site because of the overhead crane housed there, and is now ramping up again for construction of new rolling stock. From East Town the MNPL carries on across the river to Aramoho and from there continues north to Westmere onwards towards New Plymouth. So Wanganui has had three railway stations. Aramoho was the main line station in the days of passenger services whereby trains or railcars generally between Wellington and New Plymouth would stop there. In fact I remember in the mid 1970s meeting a Fiat railcar there. "Standard" railcars operated the services until 1972, while Fiats continued operating until they were withdrawn in 1977, which was the end of passenger services altogether. The second station was the one down the end of the Wanganui Branch, which is the line you can see turning southward off the bridge at Aramoho. 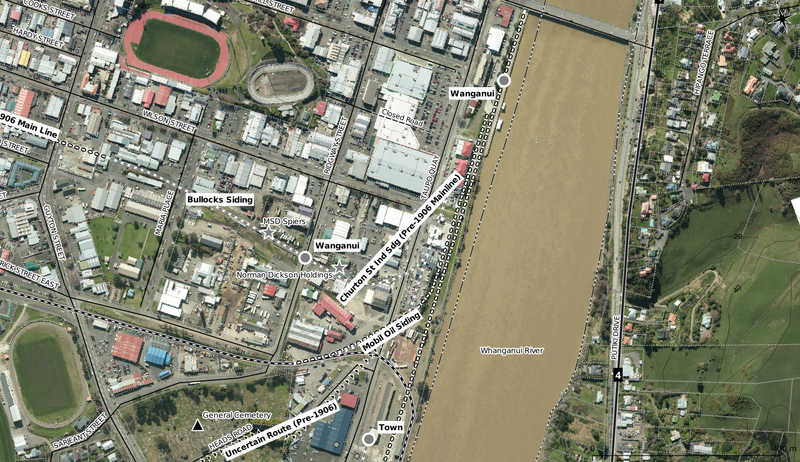 It ran for 5 km down to the general area of the Wanganui CBD where the Wanganui station originally was, alongside the Town wharf, in the days when the main part of the port was located there. Once the port declined, this station was eventually closed and the main yards were moved further down to the triangle. Wanganui did see passenger services until 1959; the Wellington to New Plymouth services always stopped at Aramoho, with a separate service between Aramoho and Wanganui. There were also services that ran directly from Wanganui to New Plymouth, known as the Taranaki Flyer; these ceased in 1959 and that was the end of passenger services to Wanganui. The station was relocated about 1987 when the junction was turned the other way to link directly through onto the Castlecliff branch. The line to Castlecliff was built as a private railway and was not nationalised until 1956. It runs for another 5 km roughly to various industries and the more recent location of the port. For example the Imlay Freezing Works in Heads Road, now closed, was a major user of the line, and at one stage they may have had their own jetty to load ships. The wharves at Castlecliff are still used but not served by rail as the end of the line was pulled back a kilometre or two some years ago. In 2006 it was mothballed as there were no sidings remaining in use. It was reopened in 2011 and one of the sites served was an inland port for Port of Taranaki. This operation has since been cut back as Port of Taranaki no longer has container ships calling, so the site is now privately operated for container transfer. 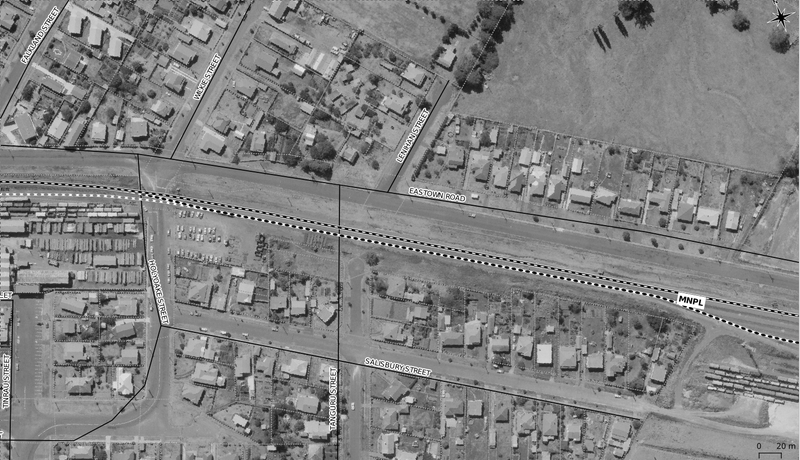 So that's Wanganui in a nutshell and once I get the aerial photos loaded in Qgis and an aerial photo I have of the Castlecliff line mosaiced, as well as more details of East Town drawn in, I will put some more posts up.